The biggest shopping season is just around the corner and it is never too soon for the giant retailers to remind us all about it. In an effort to get the Black Friday hype of to a good start, Lowe's is giving us a sneak peek at some of the deals they will be offering the day after Thanksgiving. In case you didn't know, Lowe's is on Pinterest (Tool-Rank is too), and that is where they are posting sneak peeks at some of the items that will go on sale on Black Friday. 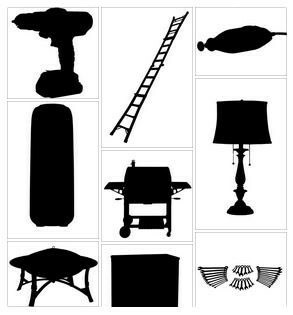 They are doing it in the form of silhouettes to try and keep us guessing, but some of the items are pretty obvious. It looks like they will be adding products to the board up until Nov. 4 at which point they will reveal the sales prices. So far the Pinterest board has what appears to be a Black & Decker Drill/Impact, a Werner Multi-Position Ladder, a Dremel Rotary Tool, a Wrench set (probably Kobalt), a grill and some other household items. If any of those items are on your shopping list, be sure to check back here after they reveal the prices.